This data set provides Synthetic Aperture Radar (SAR) images for 42 selected sites from various terrestrial ecology and meteorological monitoring networks including FLUXNET, Ameriflux, Long Term Ecological Research (LTER), and the Greenland Climate Network (GC-Net). The data set contains at least one image for all 42 sites, and six sites have multiple images. See Table 1 for the sites and the temporal range of the available images. The scenes are in GeoTIFF format in Universal Transverse Mercator (UTM), WGS-84 projection, and 15-meter resolution. The SAR images are subset scenes of approximately 60 km x 70 km that include an established site in one of the monitoring networks. The spatial resolution of all scenes is 15 meters. 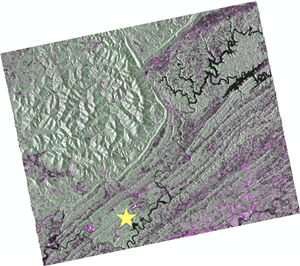 These scenes are distributed as GeoTIFF files with appropriate projection information defined within the file. The acquisition mode for all data is the Fine Beam Double Polarization or FBD with the HH/HV polarization. The HH and HV channels are distributed as 3 channels to allow for an intuitive image display. The HH band is displayed in the red and blue channels and the HV band is displayed in the green channel. For some images only single polarization is available; these images are distributed as grayscale images. The source of the data is the PALSAR (Phased Array type L-band Synthetic Aperture Radar) sensor flying on the Advanced Land Observing Satellite (ALOS). The PALSAR data are in dual Polarization, HH+HV, mode. Bands HH (red and blue) and Band-HV (green) can be used to visualize land use patterns. The resulting images show vegetation in shades of green and barren land in shades of pink or purple. Figure 1. 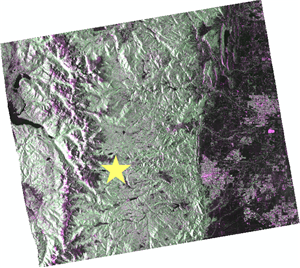 SAR images for (a) Niwot Ridge, Colorado and (b) Walker Branch Watershed, Tennessee sites. Visualizations for land use are generally set such that green is tree canopy, pink is crop or barren soil, black is water, and grays are low vegetation. The star icon indicates the location of the field site. The data can be used for a number of purposes (1) to validate the SAR measurements using FLUX tower site characterization data; (2) to examine the impacts of vegetation dynamics on climate; (3) to understand human impacts on vegetation at a local scale; (3) to detect deforestation and forest degradation; (4) to map and differentiate growth stages and change; (5) to retrieve woody biomass and structural attributes; and (6) to characterize, map and monitor ecoregions such as mangroves and wetlands. The National Aeronautics and Space Administration (NASA) funded this EOSDIS Tech Infusion project (2010) as a collaboration between the Alaska Satellite Facility (ASF), the National Snow and Ice Data Center (NSIDC), and the Oak Ridge National Laboratory Distributed Active Archive Center (ORNL DAAC) in 2010. The purpose of the project was to provide subsets of PALSAR data for selected field sites, such as flux tower locations, to increase terrestrial ecology users’ understanding of SAR, to make the community more aware of SAR data, and to promote its overall use. This project produced many scenes of SAR satellite imagery for use by terrestrial ecologists in their geo-spatial investigations. The PALSAR subsets are provided in non-proprietary, unrestricted, and user friendly GeoTIFF file format and are now publicly available at the ORNL DAAC Web site. The SAR images are subset scenes of approximately 60 km x 70 km that include an established site in one of the monitoring networks. The spatial resolution of all scenes is 15 meters. These scenes are distributed as GeoTIFF files with appropriate projection information defined within the file. The acquisition mode for all data is the Fine Beam Double Polarization or FBD with the HH/HV polarization. The HH and HV channels are distributed as 3 channels to allow for an intuitive image display. The HH band is displayed in the red and blue channels and the HV band is displayed in the green channel. For some images only single polarization is available. These images are distributed as grayscale images. This data set provides Synthetic Aperture Radar (SAR) images for 42 selected sites from various monitoring networks including FLUXNET, Ameriflux, LTER, and the Greenland Climate Network (GC-Net). There is at least one image for all 42 sites, and six sites have multiple images. See Table 2 for the sites and the temporal range of the available images. The scenes are in GeoTIFF format in Universal Transverse Mercator (UTM) projection and 15-meter resolution. Sites: Selected field sites, such as carbon and heat flux tower locations, to increase terrestrial ecologist's understanding of SAR and to promote its use. Figure 2. Locations of sites with SAR images. Table 1. 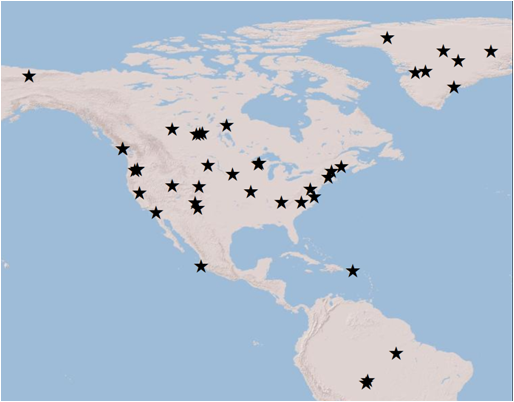 Selected environmental network sites and physical attributes. The purpose of the project was to provide subsets of PALSAR data for selected field sites from established monitoring networks for carbon and heat flux (AmeriFlux Tower locations), long-term ecological monitoring sites (LTER), Greenland Climate Network (GC-Net), and EOS Land Validation Sites to increase terrestrial ecology users’ understanding of SAR data and promote its use. The PALSAR subsets are provided in non-proprietary, unrestricted, and user friendly GeoTIFF file format. The SAR images are subset scenes of approximately 60 km x 70 km that includes an established site in one of the monitoring networks. The spatial resolution of all scenes is 15 meters. SAR subsets were extracted for the dates shown in Table 2. The exact time of the image is included in the documentation. Table 2. The selected sites, the name of their respective compressed image files, the date(s), and projections of the SAR subset image(s) provided. As show in Table 2, each site has a single compressed data file. Within the *.zip file is the GeoTIFF image file(s) with the image date appended to the file name. A *.pdf documentation file is also included and contains image-specific metadata, image analysts notes about channel assignments and colors, and a thumbnail of the SAR image as show in Figure 1. For sites with multiple images, only one thumbnail is included as images are quite similar in appearance. and the HV polarization to the green, we get these slightly more intuitive colors. Green is tree canopy. Black is water. The PALSAR subsets provided in this data set might be useful for visual interest and preliminary analysis of the field area. For in-depth analyses, such as biomass estimation, vegetation characterization, etc., users might have to download the lower level products from ASF. The data values in the image are Digital Numbers (DN) that can be used in the following equation to extract the Normalized Radar Cross Section (NRCS). Where the Calibration Factor (CF) is a constant -83. The cross section parameter is useful to quantitatively compare multi-temporal data. Because Radar emits its own signal, imaging can occur anytime of the day or night independent of sun angle. This is in contrast to passive imaging systems that require the Sun’s illumination. Due to its longer wavelength than visible light, the microwaves used in Radar also have the advantage of not being impeded by cloud cover or other atmospheric contamination. Imagery from synthetic aperture radar (SAR) satellites is not a familiar data set for most users of geographic information systems (GIS). There are several reasons why radar imagery is not commonly used, primarily because of the nature of the technology and its specialized applications. Another is that radar imagery is not optical, requiring more technical processing and specialized image interpretation skills. The SAR satellite used to create these images is the Advanced Land Observing Satellite (ALOS). ASF is a downlink and archive for ALOS in the Americas. The SAR sensor is an L-Band phased array radar capable of imaging in several resolutions and polarizations. Because radar data is ranging data that measures the strength and scatter of the radar pulse, it is not like optical imagery which is visually intuitive. To make the SAR scenes more user friendly, the polarization data was classified as reds, greens, and blues in the image. Another aspect of radar remote sensing is that the ranging data must be terrain-corrected by a process that assigns the ranging values to geographic coordinates by utilizing a digital surface model (DSM). High resolution DSM data are not available for the entire planet and existing data at high latitudes is problematic, especially in areas of very little terrain relief, such as sheet glaciers. To use a consistent DSM for this project and all of the sites being investigated, the DSM data from the ASTER satellite was used for the terrain correction. Launched on January 24th, 2006 aboard the Advanced Land Observing Satellite (ALOS), the Phased Array Type L-band Synthetic Aperture Radar (PALSAR) instrument has promising applications for natural resource and land applications including parameters applicable to terrestrial nutrient cycle estimates. Research has shown that SAR data by itself, or combined with other optical or active systems, can enhance land characterization with information not otherwise available from passive remote systems. Because Radar emits its own signal, imaging can occur anytime of the day or night independent of sun angle. This is in contrast to passive imaging systems that require the Sun’s illumination. Due to its longer wavelength than visible light, the microwaves used in Radar also have the advantage of not being impeded by cloud cover or other atmospheric contamination. Some examples of PALSAR land applications include estimates and mapping of vegetation above ground biomass, deforestation mapping, wetland (including high latitude) characterization, and cropland monitoring. The PALSAR instrument is a type of Synthetic Aperture Radar (SAR) that emits energy in the long wavelength L-Band (1270 MHz) frequency. SAR radar systems are able to generate high-resolution imagery with a synthetic aperture (or virtual long antenna) by combining signals received by the physically short (real) antenna as it moves along its flight track. As an imaging radar system moves along a flight path it emits and receives pulses in a single particular microwave wavelength and orientation (waves polarized in a single vertical (V) or horizontal (H) plane). The radar pulse interacts with the Earth’s surface and is scattered in all directions, with some energy reflected back toward the radar’s antenna. Known as backscatter, the returned signal is received by the antenna a fraction of a second later and in a specific polarization (H or V). The brightness, or amplitude, of the backscatter is measured and recorded and the data are used to derive an image. Radar waves interact differently with soil, vegetation, water, ice, and man-made objects such as buildings and roads because the backscatter is affected by the surface properties of objects. For a smooth surface such as water or a road, most of the incident energy is reflected away from the radar system resulting in a very low return signal. In contrast, rough surfaces will scatter the emitted energy in all directions and return a significant portion back to the antenna. In general, vegetation is usually moderately rough with most radar wavelengths.